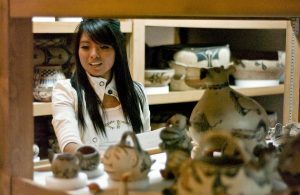 Throughout the history of the Indian Arts Research Center (IARC), many Native American artists, elders, students and children from throughout the Southwest, have utilized the collections as a cultural resource. 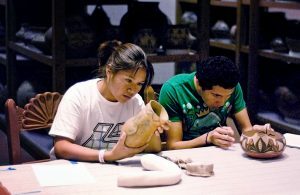 The IARC is open to tribal community groups, tribal leaders, elders, cultural leaders, students, and artists who wish to study the collections. The IARC offers tours and hands-on programming at no cost to tribal members and to children attending Indian schools. Collection Tours — The IARC has a collection of roughly 12,000 items. Tribal members are welcome to join any of the weekly Friday, 2pm tours at IARC for free. Reservations must be made in advance, however, as space is limited. Special tours outside of the regular Friday tours can also be made by tribal members and school groups. These tours are subject to staff availability. Collections Visit — Tribal members and groups are encouraged to utilize the collections as a cultural resource. Many people visit the IARC to see works by family members or to do research on collection items from their community. Artists often visit to gain inspiration for their own contemporary work. There is no cost to visit the collection but reservations are required in order to ensure availability and space. Other Programs — Given enough lead time, the IARC is available to work with community educators and cultural instructors to develop relevant programs and projects that will benefit students and community members alike. The IARC education staff will also assist educators with programming required to meet certain curriculum standards. Contact the IARC to discuss community-based programming and other cultural initiatives.